In Elfensea, as in Elfenland, young elves have to pass a special test before they are accepted as grownups. 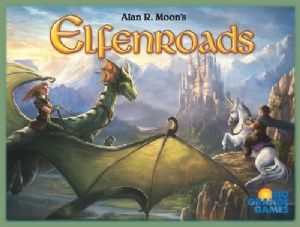 The same rules apply in Elfensea as in Elfenland, except as described in the rules. The game board map is different, and the common types of transportation — dragons, unicorns, giant pigs, magic clouds, whales and rafts — differ somewhat as well. As in Elfenland, these types of transportation are available in limited numbers and can be used only in specific regions. Thus, an exciting race starts among the elves to find out who will make the best use of the available transportation. The player with the most points wins.